Most companies have at least one process that demands approvals. Approval flows are everywhere and not handling them correctly can cost your company a lot of time. 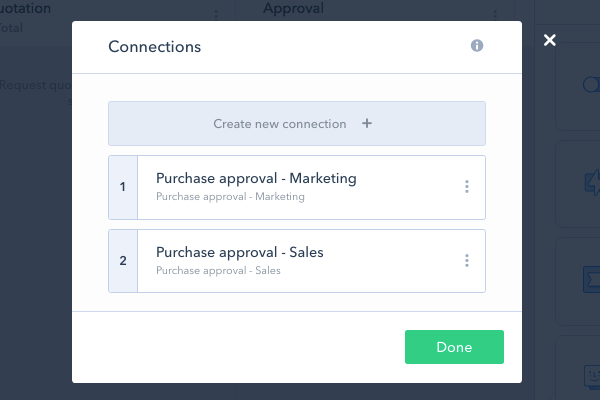 Combining two of Pipefy's advanced features (connections and automations) you can easily setup an automated approval flow that'll help save time and make your processes more efficient. To make the setup process easier to understand, we'll use a practical example. Let’s suppose you work at the procurement department of a big company. You have a big, complex purchase process in which each request needs to be approved by its department’s supervisor. 2. Create connections from the primary pipe to the secondary approval pipes using the connections feature. 3. Let’s move on to the automations. 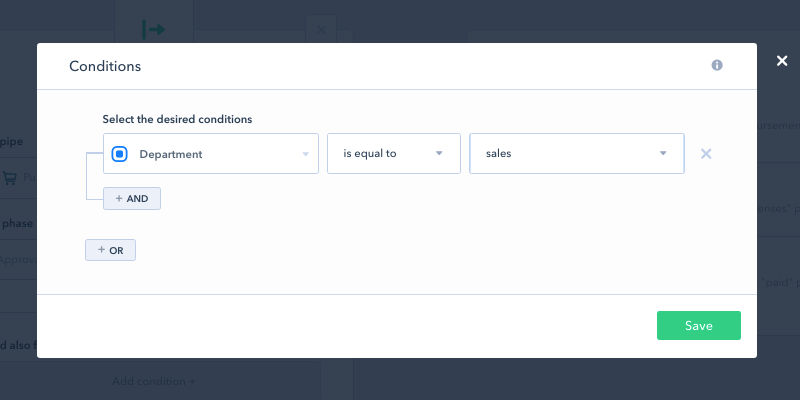 There are two possible departments that may need to approve the purchase so we’ll make the flow a little more complex by adding conditions to our automations. 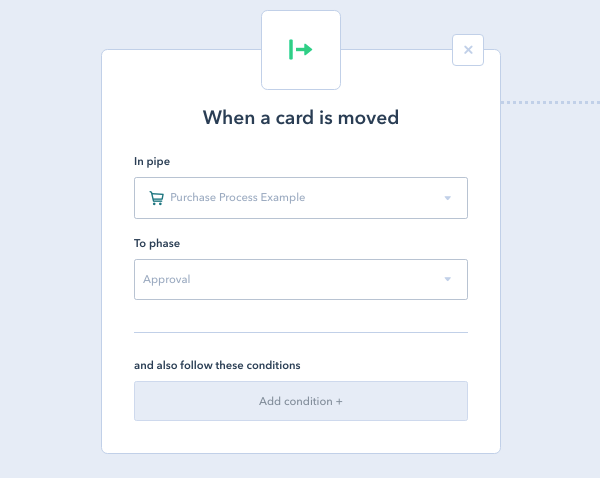 We want connected cards to be automatically created in the right approval process whenever they enter the 'approval' phase on the purchase process. Click on the ‘Apps & Integrations‘ option on your company dashboard, open the ‘automations’ app and click on ‘+ new automation’. 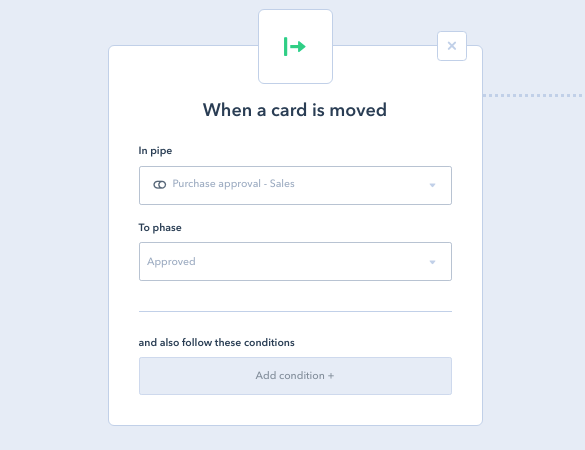 Choose the event: “when a card is moved”, in pipe “purchase process” to phase “approval”. We only want this automation to be triggered when the ‘sales’ option is selected on the department field so we’ll setup a condition. Click the “add condition” button at the bottom of the event box and choose: department > is equal to > sales. Choose the “create a new connected card” action. Choose the pipe where the connected card will be created and match the fields. Click the “save automation” button at the bottom of the screen. Before we’re done with this automation number one, repeat the entire process to setup the automation for the marketing approval flow. Automation #1 was set for creating connected cards on the right purchase approval pipe. Now we want to make sure that whenever the supervisor approves the request, the ‘parent’ card will move forward on the purchase process (to the ‘purchase’ phase). Repeat the process choosing the ‘purchase approval – marketing’ pipe in the event and voilá! Your automated approval flow is done!